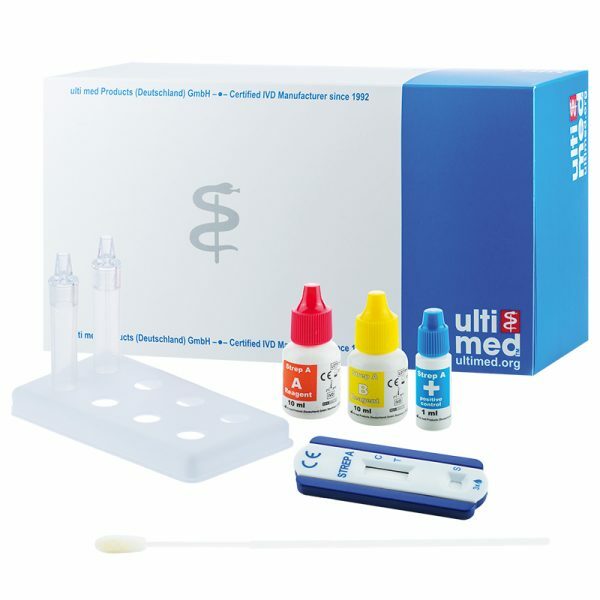 The ulti med Streptococcus A Cassette is a rapid chromatographic immunoassay for the qualitative, presumptive detection of Strep A antigen from throat swab specimens to aid in the diagnosis of Group A Streptococcal infection. Streptococcus pyogenes is non-motile gram-positive cocci, which contains the Lancefield group A antigen that can cause serious infections such as pharyngitis, respiratory infection, impetigo, endocarditis, meningitis, puerperal sepsis, and arthritis. Left untreated, these infections can lead to serious complications, including rheumatic fever and peritonsillar abscess. Traditional identification procedures for Group A Streptococci infection involve the isolation and identification of viable organisms using techniques that require 24 to 48 hours or longer. Rapid diagnosis and early antibiotic therapy of Group A Streptococcal infection appear to be the best means of preventing medical complications and reducing the spread of the disease. 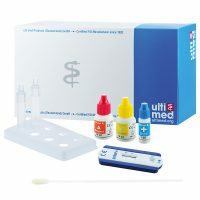 The ulti med Streptococcus A Cassette is a rapid test to qualitatively detect the presence of Strep A antigen in throat swab specimens, providing results within 5 minutes. The test utilizes antibodies specific for whole cell Lancefield Group A Streptococcus to selectively detect Strep A antigen in a throat swab specimen. The ulti med Streptococcus A Cassette is a qualitative, lateral flow immunoassay for the detection of Group A Streptococcus antigens in a throat swab. In this test, Anti-Strep A antibodies are immobilized on the test region of the membrane. During the test, the specimen reacts with polyclonal anti-Strep A antibodies conjugated to coloured particles and precoated onto the sample pad of the test. The mixture then migrates through the membrane by capillary action and interacts with reagents on the membrane. If there is sufficient Strep A antigen in the specimen, a coloured line will form at the test region of the membrane. The presence of this coloured line indicates a positive result, while its absence indicates a negative result. The appearance of a coloured line at the control region serves as a procedural control, indicating that proper volume of specimen has been added and membrane wicking has occurred.